↑ "Robin Van Persie". Soccerbase. สืบค้นเมื่อ 15 August 2016. ↑ 3.0 3.1 Young Gunner, timesonline.co.uk. Retrieved 19 September 2008. 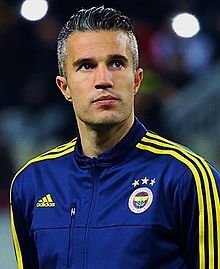 ↑ Robin Van Persie Bio, tv.com. Retrieved 16 November 2007. ↑ 5.0 5.1 5.2 "Young man's game". Sunday Times. ↑ FEYENOORD DRINK FROM CUP OF CHEER - feyenoord.com, 2 June 2003. Retrieved on 11 September 2008. ↑ Take care with Persie - The Sun Sport, 29 April 2004. Retrieved on 9 September 2008. ↑ Feyenoord slap £5m price tag on Van Persie - The Telegraph, 20 January 2004. Retrieved on 11 September 2008. ↑ Arsenal win the race to capture £3m Van Persie, Independent Online Edition, 29 April 2004. Retrieved on 1 December 2007. ↑ Van Persie hits spot for Wenger - The Guardian, 3 December 2005. Retrieved on 9 November 2008. ↑ Robin van Persie - History, soccernet.espn.go.com, accessed 29 September 2007. ↑ CBBC Newsround, Arsenal sign Reyes for record fee, 27 January 2004. Retrieved on 30 November 2007. ↑ BBC Sport, Arsenal 3-1 Man Utd, 8 August 2004. Retrieved on 30 November 2007. ↑ "เสร็จผีแล้ว! 'อาร์วีพี' รับเป็นเกียรติ เซ็นร่วมทัพแมนฯยู". ไทยรัฐ. 17 August 2012. สืบค้นเมื่อ 13 July 2015. ↑ 15.0 15.1 "แฟนแห่รับนับหมื่น! เพอร์ซี ถึงตุรกี จ่อเปิดตัวเฟเนร์ฯ". ผู้จัดการออนไลน์. 13 July 2015. สืบค้นเมื่อ 13 July 2015.